Wednesday’s massacre at the Paris offices of the magazine Charlie Hebdo was not just a barbaric act of jihadist violence. It was also a test for the West and for the freedom of speech in the West. It is a test that we all have been failing. Those of us who have proposed that all Western — and in particular European — news outlets should multilaterally publish the Charlie Hebdo cartoons have been greeted in return with a terrified and terrifyingly self-conscious silence. The papers and broadcasters do not want to do it. Last time they refused to republish the cartoons, from Denmark’s Jyllands Posten, they said it was because the cartoons were from a «right wing» newspaper. This time they refuse to republish cartoons from a «left-wing» newspaper. It does not matter what the politics are — it is not about the politics, it is about the cartoons. The sooner the press at least has the guts to admit this, the better. But there has been much worse than the cringing surrender that this refusal denotes. Consider just a couple of even worse examples from the mainstream media’s coverage of these barbaric events. In the United Kingdom on Wednesday, the Daily Telegraph newspaper was straight out of the starting blocks. Within a couple of hours of the attack, as the bodies of the slain journalists had not even been identified, The Telegraph chose to run a report headlined, «France faces rising tide of Islamophobia«! The press was already blaming the victims. Commentators on CNN opined that Charlie Hebdo had been «provoking Muslims» for some time. Perhaps they assum that it is easier to force good people to keep quiet, or keep their own media offices from being attacked, than to tackle to the problem of Islamic extremism head-on. 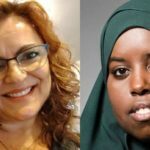 It is easier blame Geert Wilders, Ayaan Hirsi Ali, Lars Hedegaard, Suzanne Winters, Salman Rushdie or Charlie Hebdo — and even put some of them on trial — than to attack the attackers, who might even attack back! 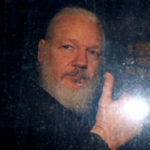 The press and the media seem to prefer a policy of coerced self-censorship: It is your own fault if you get hurt; none of this would be happening to you if you had only kept your mouth shut. It is easier to denigrate the people warning us about a danger on than it is to address the danger they are warning us about. The same holds true for Europe’s policy toward Israel: It is easier to bully an open, pluralistic democracy than to take on all those terrorists and the countries that support them, and it is to do what is necessary to get them to stop. That is also what Germany’s Chancellor Angela Merkel broadcast in her New Year’s message when she warned against the anti-Islamic «Pegida» marches in Germany: she said it was the marchers against Islamic extremism that have «coldness» in their hearts, not the propagators of Islamic extremism. And so the Telegraph’s first response piece listed the terrible events of the rise of right-wing and other forces — as though the attack were the response to radical Islam, rather than even suggest that it might be radical Islam itself that was at fault. Once again, the «backlash» against Muslims took precedence over the actual murder of non-Muslims at the hands of Muslim fanatics. Over in New York, The New York Daily News is not a newspaper that tends to pull its punches. But consider what it did while the dead were still lying in the magazine’s offices. It ran a story which showed images of a Parisian policeman at the moment that the terrorists — shouting «Allahu Akhbar» [«Allah is Greater!»] — gunned him down in cold blood. 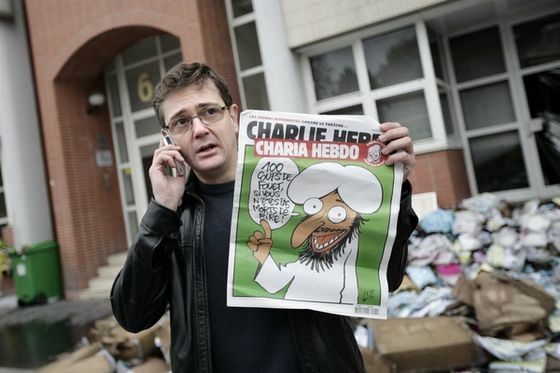 It also showed an image from 2011 of Charlie Hebdo editor and publisher Stéphane Charbonnier standing outside his firebombed offices, the last time the magazine was attacked, holding up an edition of the paper with an image of Mohammed on the front. But the image was pixelated. Yes — that’s right. The paper was willing to show a man who had been alive that morning in the process of being murdered. But they chose not to publish a cartoon of a historical figure who died 1400 years ago. Stéphane Charbonnier, the editor and publisher of Charlie Hebdo, who was murdered yesterday along with many of his colleagues, is shown here in front of the magazine’s former offices, just after they were firebombed in November 2011. «Has this to do with France’s foreign policy?» interviewers and pundits have mused. In this particular instance, the answer to that question is «no more than usual.» But the follow-on bit of the answer should be even more easily said: «So what if it were?» Let us say that you do not like France’s foreign policy. Do you think that a country should change its policies because segments of one community will run into newspaper offices and gun people down if you don’t? 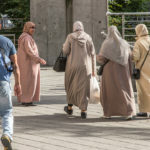 Another diversionary question has been, has been, «Does this have something to do with the situations in which many French Muslims find themselves – the banlieues (less-affluent French suburbs) and so forth?» The only answer I have so far managed to give to this question is that there are really people out there who may not like where they live but do not run into newspaper offices with Kalashnikov rifles and start firing off. Many people do not like their neighborhoods. It is not the point. There are also great loud woolly condemnations of «terrorism,» but never accompanied by naming the men or groups involved. And will we keep on blaming the victims? This all bodes very ill.
Charlie Hebdo was — I hope I can still say «is» — a magazine that satirizes any and all ideas. Their targets have included not only Mohammed, but also Christians, Jews, the French novelist Michel Houellebecq and the Front National leader Marine le Pen. 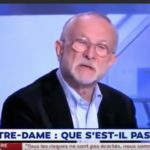 At this moment, mainstream media and politicians should be ensuring that they understand the concerns of their publics, rather than treating them as radioactive «racists» and «Islamophobes.» If those in positions of influence do not deal with this problem now, we will not like those who deal with it later.